Steering on company targets with Beegua. Your company is in a constant movement in an ever changing world and market environment. To obtain your targets you must be able to quickly observe and analyse events and act accordingly. That is a challenge, as many companies have different systems in place, all with their own complexity. The objective is to have the relevant, correct and actual data in your hands without any delays, and presented in a clear way. Beegua is the solution to realize this. Save time and money, producing your own reports and management overviews with Beegua. 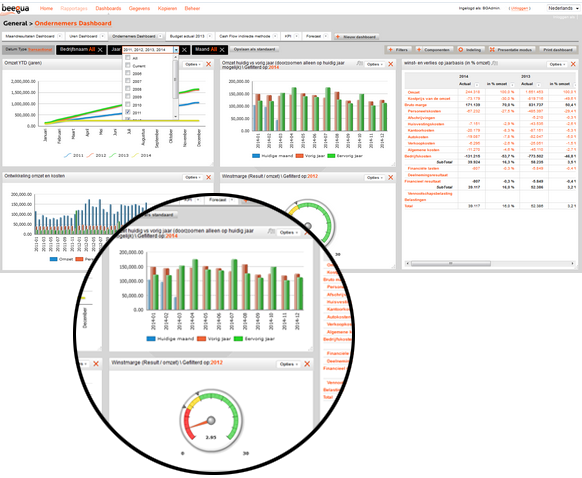 Beegua enables you to easily create dashboards, giving you a clear overview of your company’s performance, both operational and financial. Both for small, medium and large enterprises. Beegua visualizes your management data in clear graphs and KPIs. Because images say more than just numbers.